I wanted to encourage your faith regarding an encounter I had with a man fishing soon after a class at church I took on “sloth.” My pastor had been contrasting the temperaments between those who fish speechless for hours contently with those who’d rather speak than fish. There I was, one weary work week after taking in this class on sloth; Perched aloft the waterfalls edge for an end of the day earful and eyeful of the waters on the lushly banked reservoir. About fifty yards away was a lone fisherman, no doubt enjoying the tranquil of the setting as I was. “How they biting?” I yelled out. “Not” he replied shaking his head. “That’s ok, that’s not why we’re here” I replied. “Yes” he replied nodding his head. His name was Daryl and he began to share with lament how; “he’s blown it,” “found and lost his religion several times,” “God has likely given up on me.” After listening, I shared the gospel with him through Romans 3:23 & 6:23. I assured him that I fail in some way every day. However, because of what Christ has done on the cross and continues to do every day with new mercies, the power of Christ in me confirms that I will never be given up on by God. He seemed affected and I asked if I could pray with him. I thanked God for drawing two men, strangers to each other, to enjoy both the tranquil setting of His creation and ponder the extraordinary wonder of His mercy. I asked God to reveal him self to Daryl and continue to work in his life. I must say. As I become more attentive to Christ in me, fishing for the souls of men, It’s as if God places a sign that says; “Be Aware, Spirit Speaking” (B.A.S.S.) Be blessed! Ray: "Whats wrong with being homosexual?" Tim: "Good question Ray. How would you define "marriage"? Ray: "Two people who love each other and are committed to each other"
Tim: "Why just two? Why not 3 or 4 or 6?"... "I mean if we can change the genders why not change the numbers too?" Ray: "I'm going to have to think about that...."
Ray: "Every religion thinks they are right! The way I see it they are all just seeing parts of the whole. No one can claim to know the whole picture"
Tim: "Like the blind men explaining a elephant...one thinks its like a tail, another like a trunk, another like an big flappy ear"
Tim: "What wrong with that illustration Ray?" Ray: "I'm not following you...what do you mean?" Tim: "Well isn't the person describing this elephant story doing exactly what he is accusing the blind men of doing?" Ray: "What do you mean?" Tim: "Well the person describing this is assuming they see the whole elephant...and are therefore able to ascertain that others are only seeing part. We in essence are saying...you only see in part because I see the whole & you are wrong. Thus we think our view is correct. We "see" that the others are blind and only see part. Is not the agnostic or atheist doing the very thing he is accusing the religious people of doing by declaring what is true' ? Ray: "What's this presdestination thing?" Do you Christians really believe God makes it so some can never believe & must go to hell? Why does he even bother making them then?!" Tim: "Ray imagine 100 people that all owe the bank a million dollars and can't pay. A kind billionare decides to pay for 3 of them and does so but it seems to be arbitrary. Now...when the 97 debtors appear before the Bank Loan Officer, can they complain that its unfair that they have to pay their debt, because 3 of them didn't have to?" Ray:"But why not pay for everyones debt?...why only three?" Tim: "Why rather pay for anyone's debt at all if its not yours?...neither you nor I are inclined to pay other peoples debts. The question for me Ray is "Why did God pay anyones debt at all?!!" Tim: "Ray...do you know what the word "gospel" means?" Pray for Ray! One lost soul. Only one among so many. But one that has been willing to talk twice to me...with the possibility of more in the future. Back in 2007, I was reading inside of Borders in Philly during my lunch break. A guy spots me in the aisle with the Bibles, sees the Christian book in my hand and sits down to have a conversation. It quickly became evident that he held to some odd ideas. Phrases like “just be” and “we are all God” peppered his speech and he was very interested in metaphysics. We talked about my faith and I started to share the Gospel with him, but He got annoyed when we started talking about sin and how people aren’t inherently good, so he walked away quite suddenly and rudely. I was stunned for a minute because the conversation came to such an abrupt end. On my walk back to the office, I said a prayer for Jafar, thinking that was the end of the interaction since we didn’t exchange any info. But a few days later we see each other in the bookstore again and he actually apologizes for his behavior. Conversation starts up once more, but it’s clear he just wants to argue with me and barely lets me finish statements. This happens a few more times as the weeks go on and our talks were starting to become draining to me. I would say something and he would want to discuss the etymology of each word in my sentence. I soon found myself not wanting to talk with him at all. I just wanted to munch on my lunch and read in peace. At first I tried doing my reading in the non-christian aisles of the bookstore, but even if I was hiding out near the children’s fiction section, he would eventually find me. Shamefully, I just stopped going to the bookstore all together. Even though I wouldn’t have admitted it, my actions and attitudes clearly showed that I didn’t believe God could save Jafar. Talk about a small and sinful view. God (thankfully) would not let this pass away over the last two years. It didn’t matter that I avoided that bookstore, because now we were crossing paths down by Penn’s Landing or in Rittenhouse Park. The guy was popping up all over the city! I knew God wanted me to continue talking to him and He was trying to teach me about perseverance, compassion, and reliance on His Spirit. Fast forward to March 2009 - it had been several months since I had seen him. Then a few weeks ago, I was relaxing in Rittenhouse Park before going to hear Paul Tripp speak and I thought I spotted him. Since he is a professional musician, he was playing for the crowds milling by. I didn’t go over to confirm whether it was definitely him, but I knew deep down that it was. So I am sitting in service kicking myself for not talking to him. Dr. Tripp began to preach about Paul in Athens and how the idolatry he saw provoked him and he could not remain silent. He was willing to look foolish and be mocked for the sake of the Gospel. I confessed to God that I am often provoked, but not by what I should be. This past Sunday, before going to evening service again, I cut through the park one more time. I prayed to God for another opportunity and plopped myself down on a bench. Guess who walks by? We sat and talked for about 40 minutes. He actually at one point in our conversation says “I don’t need a mediator.” I almost jumped off the bench! Of course, I disagreed with that statement, but it even surprised me that he used that language. Even though our conversation looked similar to what we’ve had in the past, I left feeling grateful and encouraged. And again, the Lord used something Dr. Tripp said in his evening sermon to encourage and convict. Without the Spirit of God working in a person’s heart, of course the Gospel will be viewed as foolish. Without the regenerative work of the Holy Spirit, I would be just like Jafar, looking at Scripture as rubbish instead of truth. We were on our way to church on Sunday morning and not far after crossing over 926 where the roads narrow and are quite wooded, when we came across a gentleman who was standing outside of his car with a large tree limb behind it. David stopped the car and got out to see if he needed help. He was (my guess) a retirement age-range gentlemen who had a tree limb just fall and hit the front end of his car. He was a bit upset and said he was unsure about what to do as he hadn't brought his cell phone along. David moved the tree limb out of the way and he moved his car off the road while I used our cell phone and called the police to come. He said thanks for helping, and nice to meet you. "Well sir", I said, "we're staying with you till the police come". "Why would you?" said he. "Because we'd love to...where are you from sir?" said I and he said, "Why I'm from Ireland, but in the States for 33 years now." So while David motioned traffic around, no surprise to you, I talked to him about Britain, and he was quite surprised to see Madison wearing a Welsh Rugby Shirt. During this time who should stop then, but Jim and Honey from church to see if we needed help, and David said we're fine. Then about 2-3 minutes later, Jeff and Martha from our church stopped to see if we needed help. No, we're okay. Then, a minute or so later, Matt and Jodie from our church stopped to see if we were alright...yes, we are fine. Two minutes later, Jason and Becca from our church stopped to see if we needed help, thanks we're okay. He said to me, "Do you know all these people?!" "How do you know them?" Without being able to hide the smile, I said, "They are all friends heading to church, the same one that we attend." "Where's the church?" he asked. I pulled a How Good Are You tract out of the glove box and showed him where on the back. He said, "Hey! I know about that church!" "Yes", he said, "I live over around the Goose Creek Grill restaurant part of West Chester, and talk quite a bit with my neighbor Renee and her husband. They attend that church and are quite involved in it." He couldn't remember Renee's last name just then, but seemed more than surprised that we happened to be from the same church. We talked a little bit more about the church, we told him about the holiday concerts, mentioning some of the entertainment there like the awesome Mrs. Rosella Washington, and invited him to come as the holidays were fast approaching. The policeman came just then, and after he assured us he'd be fine then, we came on to church. I was thinking about it later and wondering about how it wasn't like an instantaneous conversion or something dramatic like that. Just a small opportunity to help someone. But then I also got to thinking, Jennifer you've got a finite mind trying to understand an infinite God...and if I was able to draw back the spiritual curtain and peek behind it, I'd see God working in amazing ways in Mr. Lappin's life. Don't limit God, you never know what or who He'll use to draw Mr. Lappin to Himself. 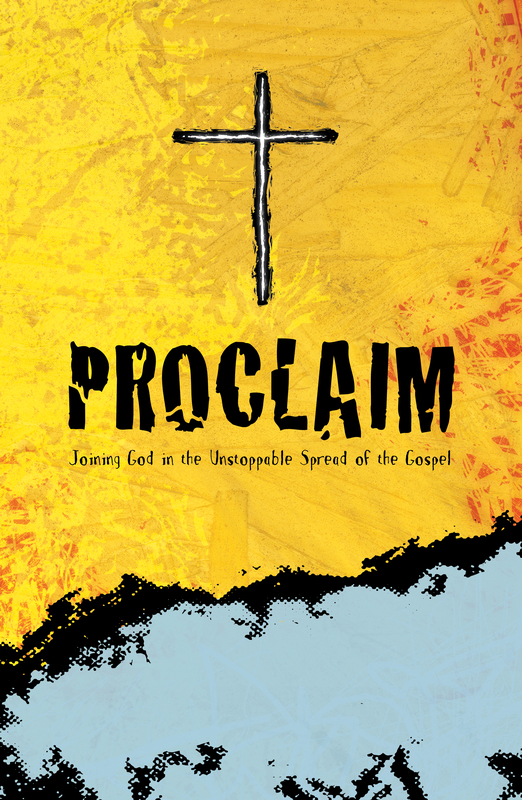 As we are walking through the Proclaim material as a care group, we would like to encourage you to share your experiences with proclaiming the good news of the gospel through e-mail with everyone in the group. Though we will have some opportunity to share as we gather in our care group setting, receiving periodic e-mails from you, Christ's laborers in the harvest, will give every one fresh reminders of God's faithfulness to see his gospel established in the hearts of sinful men. Sharing the gospel includes reaching out with our unique gifts and personalities. Some styles of outreach are more direct, others intellectual, testimonial, relational, invitational, or serving. Different situations call for different styles of outreach. So whether we have handed out a tract, invited someone to church, had an opportunity to engage in a lengthy intellectual dialogue, served someone evangelistically, or directly communicated the gospel, let's share our experiences. Share what went well and what didn't! Remember that personal rejection isn't failure, but a reason to rejoice (Matthew 5:11-12). As we share stories of our gospel proclamation, let that provoke us toward prayer for the lost, and for each other. Zane is a co-worker that I have known for several years. He also used to work with Josh Payne. He identifies himself as a Buddhist. A few nights ago I had the opportunity to engage in conversation about the gospel with him, and to my surprise, he seemed somewhat receptive. He agreed to come to church when he has a Sunday off. Lupe is a housekeeper at the Hotel at which I work. She has had tremendous family trials lately. I was able to give her a "How Good Are You" tract. It was one of those encounters that felt very awkward to me, and as she walked away with the tract I thought, "boy, that was ineffective!" Of course, that was my flesh speaking, but I think we can all identify with those awkward moments. Art works at the U-Haul store off of Main street in Little Elm. I have been at the U-Haul store a few times, and he has been impressed on my heart. Last week I thought about going to visit him at the store with the purpose of giving him a tract. I wrestled with that thought, and decided not to go. This morning he came back to mind. After some time in prayer, I drove over to CVS and picked up a small gift, went to the U-Haul store and invited him to church. We had about a five minute conversation, briefly going over the tract. He was not hostile, but made it known that he was expecting to get busy soon. I was able to get his e-mail address, and will be doing some additional outreach that way. Proclaim the gospel and leave the results to God. I'm so pumped about my GO experience last night, I thought I'd share with you so you too could get pumped about the teaching you've all labored so hard on, bearing fruit. This touched me for several reasons... one which began a little over a year ago when I was going through a time of feeling "insignificant" in God's kingdom. Yes, I knew that my first priority was my husband and 5 kids, but I wanted to do more that would impact the world now and not later. During my struggle, I was waking up every night about 2:30am and unable to go back to sleep. No, I don't have any problem sleeping usually, but God was waking me up, so I found myself asking him each night, "OK, Lord who are we praying for tonight?" I found myself praying for all kinds of people, ministries, and leaders. After a couple of months of this, I had a dream that just awakened my soul to what the Lord had for me. I had a dream where I was on my knees next to my bed praying. As I was praying, the Lord showed me that exactly what I was praying was happening on the other side of the world! I woke up, then woke up my husband David and told him what I had just saw in my dream. I was so moved. I knew what the Lord wanted me to know... it was this: "I have everything I need to be significant in God's kingdom, it's prayer. With prayer, I can change the world. It's the power that God gives me to move mountains, heal and change the world." From that night on, I was at peace with my place and the significance I have in God's kingdom. Now, you're probably wondering what this has to do with my GO experience. Well, a few days ago I got an email from our small group leader reminding us all that we were going out for another GO experience. Immediately, I felt, "Oh, no! I really don't want to go." But, I prayed in my heart for those we'd talk to and that the Lord would even now, prepare their hearts. I prayed that if I stepped out in obedience to my authorities, that the Lord would meet me and make my experience very positive. At that point, I gave it to the Lord and decided I'd just roll with it and see what happened... after all, maybe I wouldn't need to go and I was getting nervous about nothing. Yesterday, when I knew we were going, I again prayed, and knew in my heart that I was going to do this... so, just like when I know I have to do something, I just determined in my heart to go for it (even though I still was nervous). I told my husband when he got home, "I'll go with you again and watch you and throw comments in along the way." He said, "Oh, no! I did it last time and now it's your turn!" (BTW- last time he did a GREAT job and is very comfortable doing this kind of thing. Ever since I've met him he's been talking to strangers about the Lord.) Well, we got to small group, and after watching the video, took off for where ever the Lord lead. As we drove down the road, we determined to go to a local park that I'd never been to because it was such a beautiful evening. David went first and walked up to a Latino gentleman. The man did the questionnaire, but it was obvious he wanted out of there giving "I don't know." as his best answer. We invited him to come to church where, he could know, and let him go. At this point, David turned to me, put the pad in my hand and said, "Your turn!" I took it and said in my heart, "Ok Lord. Here I go. Show me who you want me to talk to and Please let this go well." I looked around the park and saw a young woman sitting on a bench alone looking at her cell phone. I decided she was the one. I told David and Cindy, "I'm just going to be honest with her." So, I walked up and said, "Hey, would you do me a favor? My church wants me to do this questionnaire and I really don't want to, but I need someone to let me do it. Would you do it for me?" She said, "Sure! I'd be happy to!" I was thrilled!! I sat down next to her and we found that her name was Dawn and has 5 kids, so immediately we had something in common and we could relate to each other's hardships. Dawn went through the questionnaire and I knew by her answers that this was going to go well. She then listened with interest to me read through the booklet and we really had a good time just talking through it. At the end, I read the prayer, and Dawn was nodding her head. She told me, that a year ago she had cervical cancer, chemo-therapy and really needed this then (holding the booklet and invitation to church), but she needs it even more now! She told me that she'd definitely be at church and asked me how to get there for this Sunday. I explained that the only bummer about our church is that it is 30-35 minutes away, to which she replied, "I don't care! I want to go." I gave her my number and name on the back of the booklet and told her to call me if she was going... I'd be happy to meet her there, help her get her kids to children's ministry (which I told her was wonderful, how my family was involved and how much we love it.) and sit with her. She then shared with me that 4 days ago she was thinking about this (she was holding the booklet in her hand). She said, "It's kinda weird that I'm talking to you now... it's no coincidence." I shared with her that a few days ago, I was praying for her and here I am talking to her. I could have gone anywhere in the area... now that is no coincidence!! God once again, answered my prayer just like He showed me He would in that dream. Honestly, it's been a whole year of things like this... I shouldn't be surprised, but it's so awesome to see it so clearly and be encouraged by the Lord that He's with us all the way. Please pray for Dawn. I'm hoping she'll call me and we can connect again. As I laid in bed and thought about it, I realized, there was so much I could have done better, but I'm praying that God gives me another chance to speak with her... maybe become her friend and a support in her life. I hope this encourages you like it did me.... thanks for pushing us past what we are comfortable doing! Lord, Please Give Me The Words! Then I looked around and he was sitting and looking at the Christian selection. I noticed that he didn’t have any books in his hands and the words came to me; “you couldn’t find anything interesting?” He said he really wasn’t looking for anything in particular. Then he mentioned how he thought Christianity and Islam were the essentially the same or maybe the Islamic religion was taken from Christianity. Or maybe you could be both Christian and Islamic. My reply was “Christianity is the only religion in the world where the believers don’t have to try and work their way to heaven.” He agreed and said, “but we all mess up.” I agreed with him and said, “we all sin and that’s why God had to come to earth, die on the cross; to pay for our sins.” He agreed with me and said that “He’s coming again but not to do it again.” I said, “that’s right, He has already paid for sins and there’s no need for the sins to be paid for again.” Then we talked about how Jesus is going to return one day and take His people home with Him. Then I pulled out a “How Good Are You?” tract. I asked if he would take the test and that I had already failed it. Then I showed him the map and phone number to our church on the back. I even gave him directions and invited him to attend our church. I told him what a great bunch of people who go there. You could say I got a little excited, but that’s normal for me. Before we parted he thanked me for the tract and invitation. As I took the three books that I had chosen to the check-out, I couldn’t get the smile off my face. I thanked the Lord for what I had just experienced and prayed that my new friend would accept Christ as his Savior! 1. People are starting to pray for and contact their unbelieving friends. Each week we hear stories of new conversations with unbelievers. Last week a shy man in our congregation told me about his conversation with his mother that has resisted the gospel message whenever he brought it up in the past. He said he had not spoken about Christ to her for a very long time because of her attitude...but the other day in the car he started to spontaneously share the gospel with her. The amazing thing about this story was that he did it all in Cantonese...even though he barely speaks the language. His wife, sitting beside him who is fluent in Cantonese was amazed at the flow and accuracy of his words. He was able to share the entire gospel with his mom in her heart language! She listened intently the whole time. Another man in our church visited a Ugandan couple and used the How Good Are You? tract to share the gospel with the husband for over an hour and then invited them to church. They said they wanted to come. One women had started to talk about spiritual things to her hairdresser...but was helped by God to take the conversation from spiritual values to the gospel itself. The woman seemed very open to hearing the message and maybe will come to our church barbecue we are planning for unsaved family and friends. Others in our church have told me how they are planning to have unbelieving friends over for dinner with other couples from the church with a common interests. Three men in our church are regularly speaking to a co-worker that does not know Christ and he is now regularly reading his Bible. There is more...but time does not permit the telling. 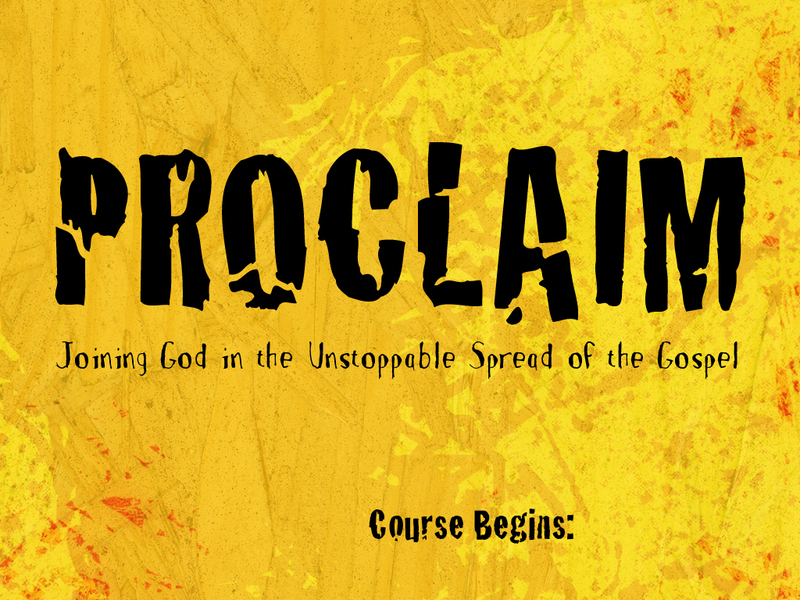 All this because of what God is doing among us through the Proclaim series. So thank you! Thank you for making this investment! Thank you for taking the time and effort to put this together! Thank you for equipping our church to do its job! 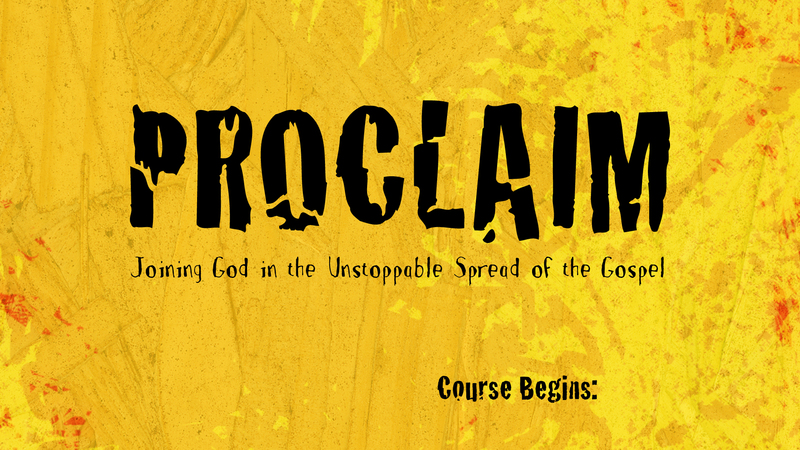 I have no doubt that their will be people in heaven from our area who will be direct fruit of this series. Grateful to God for you! "Would it be O.K. if I came to church...?" I went to the bank to cash my check and, though I usually don't, I decided to go through the drive through. As I reached into my back pocket for my check I instead pulled out a "How Good Are You?" booklet that I had forgotten was there. The Lord seemed to prompt me to place it in the canister with my check and deposit slip and so I sent it whooshing through the vacuum tube to "whosoever" God may ordain to be on the other side" (I'm a Calvinist, after all!). I waited more than a few minutes and finally a middle eastern young woman came to the window and through the speaker said enthusiastically to me, "Thank you so much for the little booklet...what is it about?" "It gives a simple explanation of what the Bible says about how we can be right with God" I replied. She said, "I have never been to church but have been wanting to go, would it be O.K. if I came and brought a friend with me? ", she asked. "Oh yes, we would love to have you" I said with surprise and excitement. After asking about service times she told me that she would come on Sunday.